The Diocesan Calendar shows what is happening within the Diocese of Thunder Bay. Events are in four categories: Bishop Colli's meetings and events are in red, diocesan events are in green, parish based events are in gold, and youth events in blue. The full month and year version of the calendar can also be viewed. Contact us at the chancery office and we will consider adding your event. Would you like a deeper relationship with our Lord? Discover and experience a deeper meaning of the Mass and Eucharist through this 3-week video series on Tuesdays, April 23 – May 7, 2019 at 7:00pm at St. Kateri Church. For more information, call 807-631-7467. The Kitchitwa Kateri is hosting a prayer night every Wednesday evening at 7:00pm in their boardroom. Join a night of prayer, music and worship, based on the Life in the Spirit. For more information, please call Grace Esquega at 807-285-8598. This convention will be held April 26 to 28, 2019 at St. Agnes Parish. Delegates from northwest Ontario will meet for workshops and information sharing. The theme will be “Caring for Our Common Home” with topics to be explored including Laudato Si, street nursing and human trafficking. Your parish CWL will have specific details about the agenda and registration. All are invited! St. Patrick Cathedral will be celebrating a Blue Mass on Sunday, April 28, 2019 at 1:00pm to show support and appreciation to the men and women of Thunder Bay First Responders. Invited to this Mass will be members of the Thunder Bay Police Services, O.P.P., R.C.M.P., Anishinabek Police Services, Thunder Bay Fire Rescue and Superior North Emergency Medical Services. A reception will follow. Everyone is encouraged to attend! St. Andrew’s Catholic Cemetery (Diocese of Thunder Bay) is owned and operated for the benefit of the Catholic public by The Roman Catholic Bishop of Thunder Bay. The Cemetery is intended for the interment of the human remains of Catholics who are entitled to Christian burial according to the rules and disciplines of the Church, and no Interment Rights Holder or other person shall have any right beyond those granted or conferred by these Bylaws. St. Andrew's Cemetery page contains the following information. 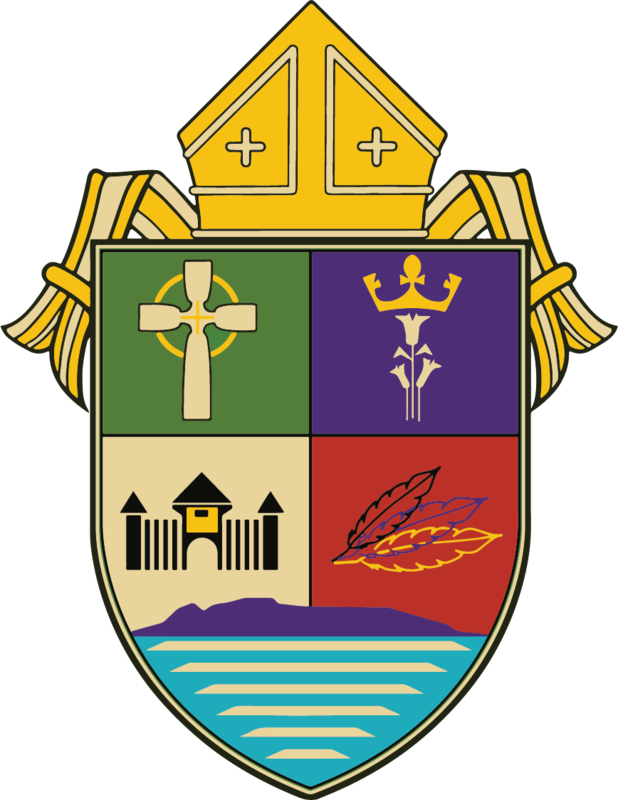 The diocese of Thunder Bay is divided up into 3 distinct areas. Central, West, and East. This covers a vast distance between the Manitoba Border, all the way to Manitouwadge. You can view the parishes in the regions below. The Diocese of Thunder Bay is located in Northwestern Ontario. It stretches from Manitouwadge in the east to Kenora in the west, is bordered by Lake Superior and the U.S. border on the south and goes as far north as Red Lake and Balmertown. The Pastoral Centre provides resources to individuals and parishes. The Pastoral Centre is also where the Bishop and his staff oversee Diocesen operations. General Information about the Pastoral Centre can be found here. The Archives is the official repository of records and materials in any form created by the Diocese of Thunder Bay pertaining to the spiritual and temporal affairs of the Diocese. Roy Piovesana is the archivist / historian with the Roman Catholic Diocese of Thunder Bay. The Diocesan Office Hours are Monday to Friday 8:30 to 4:30. Closed for lunch from 12:30 to 1:00 every day. People may leave a message on our answering machine after hours or during lunch time. Links to various Catholic Organizations in the Diocese, Canada, and the world. Every Minute, 31 people are forced to flee their homes. Bishop Fred Joseph Colli is the current bishop of Thunder Bay and area. The Bishop's Office oversees all day to day operations of the Diocese, the Pastoral Centre and local Catholic parishes. This also includes Diocesan Development, the webmaster, and finance offices. or by calling the Pastoral Centre. In regards to the Catholic Faith the Diocese of Thunder Bay has a number of spiritual and temporal resources available to everyone. The Diocese of Thunder Bay has a number of catholic outreach programs to help further the needs of catholics. The Roman Catholic Church welcomes new members. The Rite of Christian Initiation of Adults (R.C.I.A.) is a process for initiating new members through a gradual spiritual formation process. The goal of R.C.I.A. is to foster or deepen one’s personal conversion to Jesus Christ, to live the gospel proclaimed by Jesus, and to celebrate the Catholic way of life as part of a parish community. Find out more about the R.C.I.A program. Religious goods are available for purchase from the secretary at the Pastoral Centre. Items available are sacramentals, books, items suitable for confirmation or baptism, and other resources. Feel more than welcome to view our featured items page.